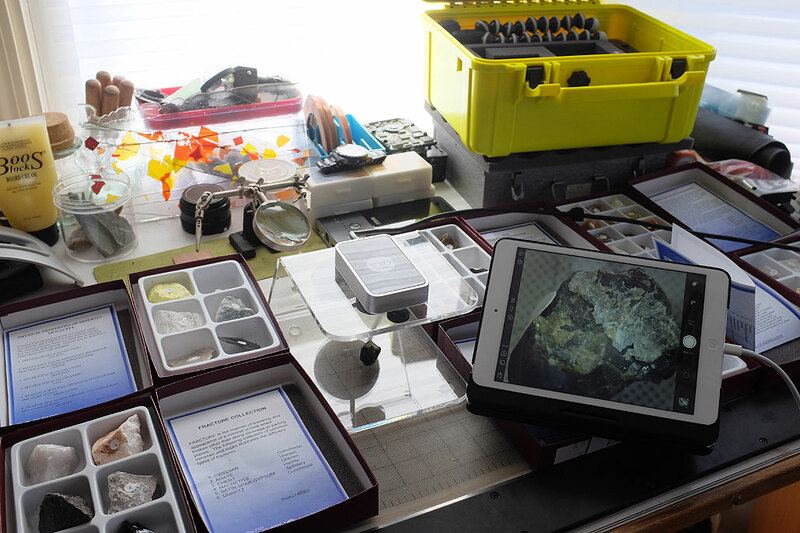 There are many tools one can use to examine features of geological samples. Old-school magnifying glasses work pretty well: no batteries needed; very portable. Of course, the ability to measure, record, and share what one sees is a bit limited with this technology. 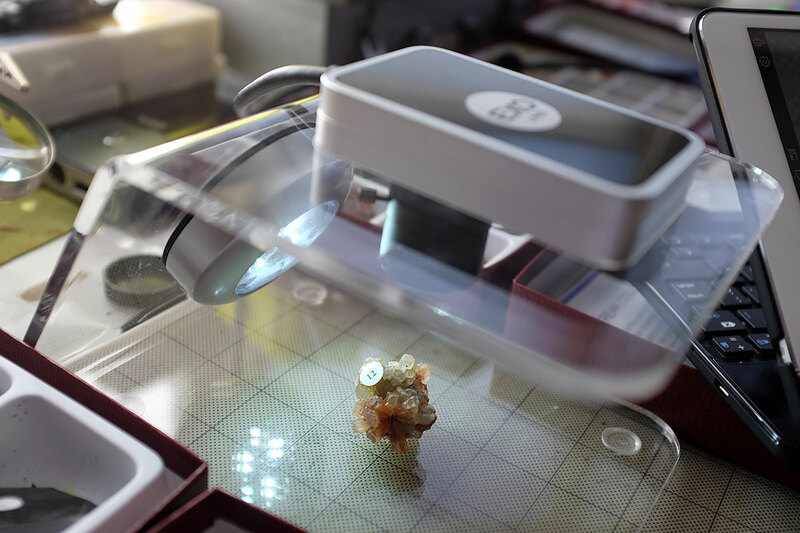 One can use a low-power microscope to see a feature at close range. A more high-tech approach, though, is using the EXO Labs Focus camera and the iPad mini. The setup is pretty simple to use but extremely powerful in terms of features and capabilities. Besides the ability to get in close with the object, the camera/iPad combination makes it possible to share what we see with others, whether they are next to us on the bench, on the WiFi network, or, with a bit of work, remotely somewhere else in the world. Fixed-position stand: durable, sturdy, clear acrylic stand provides convenient attachment of the Exo Labs Camera. Variable focus lens: enables users to manually control zoom, focus, and aperture for a variety of viewing scenarios. Built-in LED light source: for illuminating subjects in view; push-button on/off. (uses 3 AAA batteries, included). The stand is custom-built for the camera. A single screw affixes the camera to the stand. Once attached, the camera is firmly held and samples may be easily swapped in and out without disturbing the lens settings. The optical zoom and focus adjustmentson the lens are easily accessible from beneath. The clear stand lets in a lot of light, but if more is needed there is a 3-bulb LED light within easy reach. The lighting module has a push on/off switch on the body and is attached by a twist-on mount in the back of the stand. The cable connecting the iPad and the camera is long enough that the iPad (i.e., the screen) may be placed where convenient. The output of the camera is seen directly on the iPad. It is pretty easy to adjust the image and record the results. An added benefit of the iPad over a dedicated screen is that the native iOS features such as AirDrop, iCloud, and other sharing capabilities are seamlessly available. The clear stand has a 4″ clearance from top to bottom, large enough for examining a good size specimen. The one slight drawback with the current setup is there is no option for viewing from the bottom. However, we have a few ideas for a DIY to solve that limitation. This Focus camera and the accompanying iPad app from EXO Labs are both very intuitive to use. The combo is built for making direct measurements, taking photos, and other such tasks. However, what really makes the Focus shine is the ability to easily share what is being looked at under the lens. This single feature makes the Focus an intriguing tool for many potential applications. While the utility of the EXO Labs Focus in the classroom is obvious, we think there is also a huge potential for this tool as a field instrument. We intend on exploring this facet of the camera in future articles. 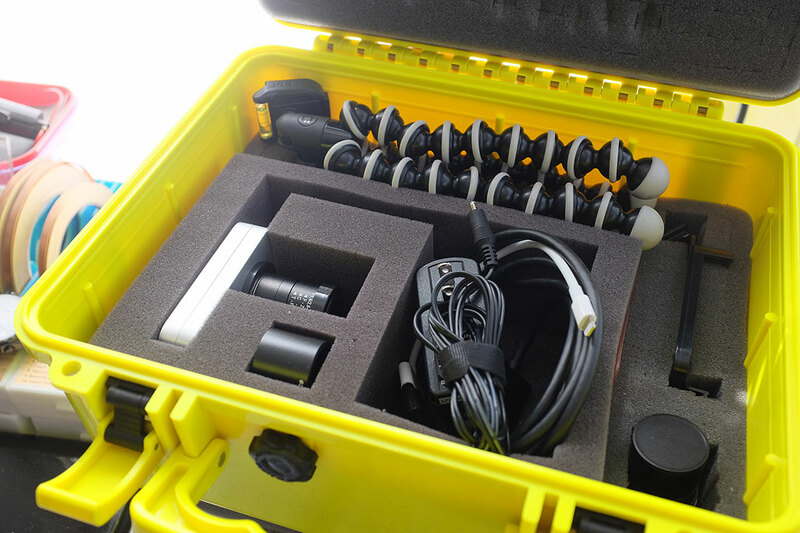 As we had stated in a previous write-up, we would love to find a power source to take the EXO Labs Focus mobile. We have looked at a few different power options and will share our findings in an upcoming article. Look for it in May!